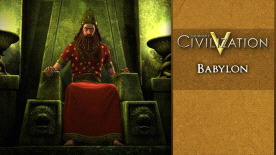 Players can continue expanding their conquests with the Babylonian Civilization Pack as the Babylonian ruler, Nebuchadnezzar II (c. 630 – c. 561 B.C.). As King of Babylon, gamers will be able to expand their empire with advanced Babylonian Bowmen to rightfully earn the title of Nebuchadnezzar the Great. © 1991-2010 Take-Two Interactive Software and its subsidiaries. Developed by Firaxis Games. Sid Meier's Civilization V, Civ, Civilization, 2K Games, Firaxis Games, Take-Two Interactive Software and their respective logos are all trademarks of Take-Two interactive Software, Inc. Fork Copyright © 2010 Fork Particle, Inc. Rapid XML Copyright © 2006-2010 Marcin Kalicinski. Lua Copyright © 1994-2010 Lua.org, PUC-Rio. Uses Granny Animation. Copyright © 1999-2010 by RAD Game Tools, Inc. Uses Miles Sound System. Copyright © 1991-2010 by RAD Game Tools, Inc. The ratings icon is a trademark of the Entertainment Software Association. All other marks and trademarks are the property of their respective owners. All rights reserved. The content of this videogame is fictional and is not intended to represent or depict an actual record of the events, persons or entities in the game's historical setting.